All of you should know Hat Yai is one hour slower than Malaysia, I have no idea was it only me or all of them also noticed that the time passed super duper slow over here, we always feel that we spent quite some times in a place but actually it was just roughly 30 minutes. So it was quite relaxing since we spent most of our time wander around the city or just simply rest in hotel. We departed 2 hours earlier from dinner time to Central Festival, a new shopping mall opened its doors to shoppers last December. Central Festival is with quirky crystalline form in and out, you can find a lot of international or local brands here. Too bad we were there not for movie but shopping and dinner, if not I think I'm gonna fall in love with their cinema, see how huge is the waiting space they provided. They even provide numerous of sofa for people to sit, too good to be true. Been poisoned by my sister since her last trip to Bangkok and bought some hair serum from Beauty Cottage, a brand which is yet available in Malaysia. One of her purpose to go Central Festival was to restock her hair serum, I bought some too together with eye masks. We got 10% discount by using sister's member card and free one eye shadow with purchased more than 500THB. Still thinking want to do a review on it not, since I never did one before and I don't know how to. Laugh! Let's see if I'm free or not. Dinner time! Went to Shabu Shi for their eat-all-you-can buffet for only 299THB per pax, with given 90/120 minutes to dine. Was thought it would be more joyful to share a pot together and throw everything we want in the pot; turn out it was quite packed and us who sit far from the conveyor belt had difficulty to get the food. Overall the food is okay and I love the pork bacon the most, can't remember how much I had that, around 20-30 plates? Laugh. Other than the shabu shabu, they do have sushi corner, dessert corner, soup corner and etc. This is the restaurant that make us wanted for more throughout the whole trip. Will definitely go back again if we happened to go Hat Yai again. 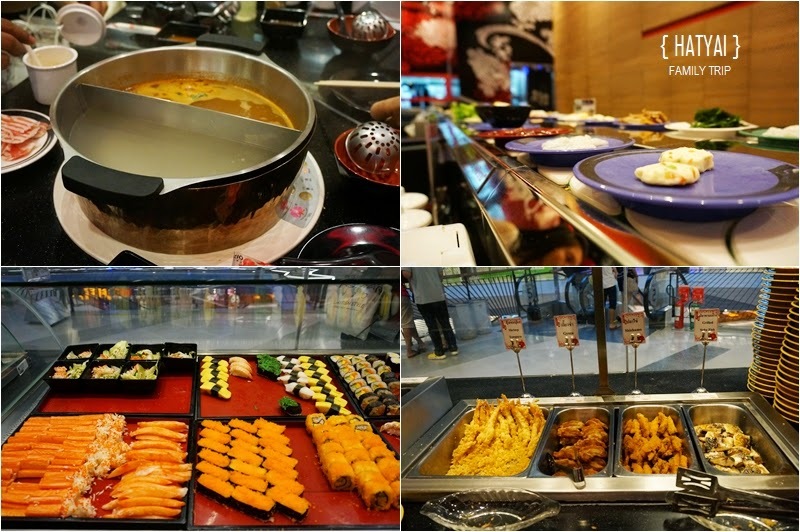 Shabu Shi is located at Floor 5 of Central Festival, if you couldn't locate it correctly, don't panic, the whole Floor 5 will make you drool as most of the restaurants at Floor 5 are buffet style, with reasonable price! After that, we moved to the night market nearby Lee Garden Plaza by tuk-tuk, the fee was slightly expensive than day time, around 30THB per pax. You can do food hunt along the street, but personally I think the price for the hawker stall are quite expensive, it's better for me to have my dinner in shopping mall. I feel regret for not trying their Burapha Bird's Nest-Shark Fin (东方燕窝-鱼翅), their bird's nest only cost around 200THB; everytime we walked by the shop, it was either after lunch or dinner. Sigh. Along the street, you will get to see the baby elephant, you can buy some sugarcane bundle (around 10-20THB) from the owner to feed the elephant. Saw the guy (owner) holding a hook kind of thing? It's use to poke/scare the baby elephant if they are not obey to him, I feel it's quite cruel and feel sad to the elephant. I think it is illegal to bring elephant to the market, he was then warned by police. It successfully caught my attention when I first passed by the stall, so whenever I passed by here, I'll stop and have a look on their prawn (and take a shot, I got plenty of these photos lol), the size of the prawn was bigger and bigger everytime I passed by. But I didn't get one to try, it should be not really expensive for one. Maybe one of it can already boost your cholesterol level. Laugh. If you didn't try their Mango Glutinous Rice, you cannot tell people you went to Hat Yai/any part in Thailand before, it's their signature food anyway. Bought one packet from the market and shared with my sister as our supper; if not mistaken the street has more than 2 stalls selling the mango glutinous rice, but I guess this should be the most famous as people willing to queue for this while others have no one to queue. It should be cost around 30-50THB per pack. This was how we spent our 1st day in Hat Yai, going to post the 2nd and 3rd day (half day) once it's ready. It's time to work hard after play hard for 2 months.